The Associated Press reported that U.S. Olympic swimmer Ryan Lochte's robbery allegations were fabricated, noting that the "swimmers were in rowdy gas station confrontation." On Sunday, Aug. 14, four U.S. Olympic swimmers — Lochte, Gunnar Bentz, Jack Conger, and Jimmy Feigen — claimed they had been robbed at gunpoint by armed robbers posing as police officers. Update: Brazilian police officially declared that the four U.S. swimmers were not victims of robbery, BuzzFeed News reported. Instead, they said that the swimmers "vandalized the restroom" of a gas station and tried to leave before police officers could arrive to help. Earlier: After making the allegations, Lochte spoke with NBC news, saying, "The guy pulled out his gun, he cocked it, put it to my forehead and he said, ‘Get down.' I put my hands up, I was like ‘whatever.’ He took our money, he took my wallet — he left my cell phone, he left my credentials." However, his claims didn't hold up for Rio Civil Police, who released a surveillance video from a gas station which shows the athletes fighting with security guards and damaging the facility, according to BuzzFeed. On Wednesday night, Bentz and Conger were removed from their flight back to the U.S. by Brazilian authorities as they investigated the swimmers' claims. After receiving the video footage as well as witness testimonies, Brazilian investigators determined that the swimmers' story had been fabricated. According to The New York Times, the officer who reviewed the video footage said, "Unfortunately, the swimmers told one lie after another ... We've been able to determine that there was no armed assault." 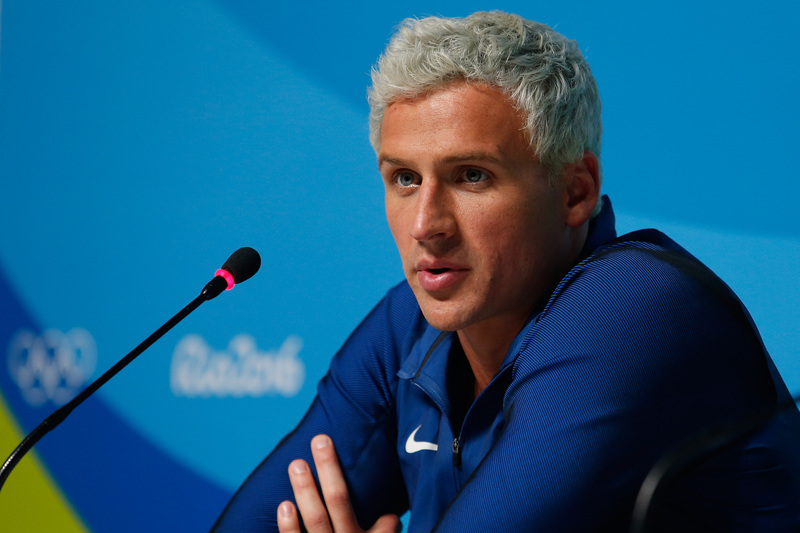 According to their initial account of what happened, Lochte, Bentz, Conger, and Feigen were robbed at gunpoint on Sunday, losing their money and wallets. However, questions arose after Brazilian police suggested that Lochte's wallet was detected in an x-ray scan upon the swimmer's return to the Olympic Village, prompting them to question whether the robbery really happened. Brazilian authorities suggested that the story was fabricated. According to their description of the events, a taxi took the swimmers to a Shell gas station at around 6 a.m., where they went to the bathroom, The New York Times reports. The investigators noted that the athletes then damaged the bathroom door, and an altercation ensued between them, the manager, and a security guard, according to The New York Times. This incident has caused so much damage to Rio's brand abroad that I think Brazilians deserve a clear, consistent account of what happened. [The entire episode] has tapped into one of Brazilians' biggest pet peeves — gringos who treat their country like a third-rate Spring Break destination where you can lie to the cops and get away with it. In a statement released on Thursday, United States Olympic Committee spokesperson Patrick Sandusky said, "The three U.S. Olympic swimmers [Bentz, Conger, and Feigen] are cooperating with authorities and in the process of scheduling a time and place today to provide further statements to the Brazilian authorities. All are represented by counsel and being appropriately supported by the USOC and the U.S. Consulate in Rio."